Is working without topicons-plus, and is provided as a extension. Just a note at @joekamprad 's findings, the icon adepts the icon theme that’s in use. This is not the worst thing, in fact I think it’s a good thing, but I’m just saying it, in case someone says the icon looks different in their system. Very often, it starts downloading updates and then stops. Download progress bar gets locked and this is it. The only way to restart updates is reboot OS. 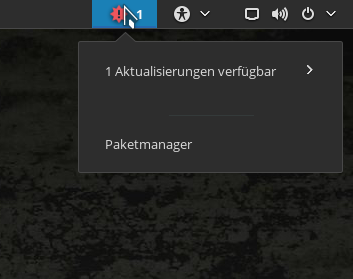 Never happened with old updates manager. if you have yay for aur do in terminal : yay -Qua ? there any updates ? @toxpal ithink the other are Aur updates , you can checkup intoo the settig to switch of also to check if its so. Do you have AUR enabled in Pamac? The new version has reset the settings to default, so it could be AUR updates, from previous install, but pamac doesn’t show them, like @ringo32 already said. Yes, I have AUR enabled. However, previous versions of updater always displayed the number of updates (including AUR updates) properly… So I did nothing now, rebooted OS, and… got a notification about available updates. Only this time (after reboot), the number of updates (displayed in notification tray) was correct (20 updates, not 54). vas. 08 15:25:06 desktop systemd: pamac-system.service: Succeeded. vas. 08 15:26:27 desktop systemd: pamac-system.service: Succeeded. vas. 08 18:30:09 desktop systemd: pamac-system.service: Failed with result 'signal'. vas. 08 18:30:09 desktop systemd-coredump: Process 8859 (pamac-system-da) of user 0 dumped core.